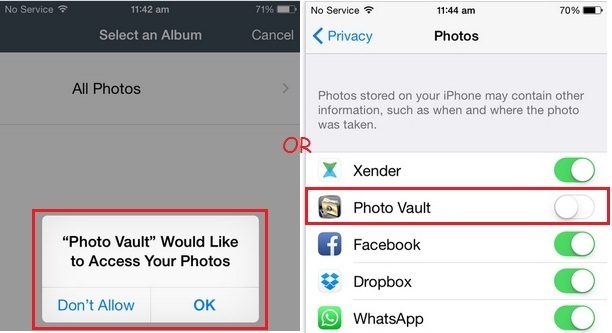 Make your private photos hidden from your iOS device’s photos app without jailbreak device. After that, you can export or save back into the camera app. Without ant technical knowledge you can hide photos on iPhone camera roll and Video as well. Not only from your Camera roll but also from My Photostream, Favorites, Panoramas, Videos, Slo-mo, and another Third-party application folder that is showing inside photos app: Dropbox, Xender and any other. Useful: How to turn on the camera without open lock in iPhone & iPad screen. Compatible devices: iPhone, iPad and iPod Touch running on iOS 11, iOS 10. Here, is the great app for hiding Photos/ Video on the iOS device running on iOS 7 and later all. Step 1: Download, Private Photo Vault app on your device and Launch it. Step 2: Follow the onscreen instruction during setup and allow access your iPhone’s camera roll. By forgot you had selected don’t Allow then allow permission for access camera roll Setting > Privacy > Photos > Enable toggle for Photo Vault. Step 3: Next, Tap on the Album, and Add the first album. 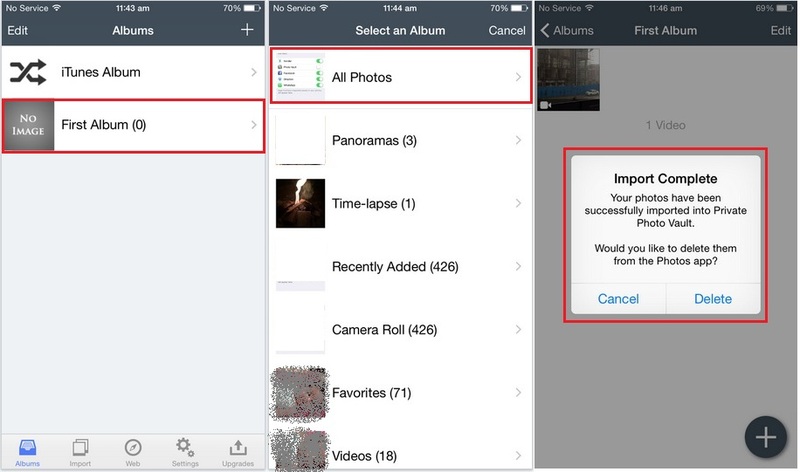 Step 4: Now you can choose multiple photos, Video at once and encrypt or move into Private Photo Vault. So this app will care your all media file securely with password protected. In the moving process, you have to delete from camera role for remove from Photos app, Note that, you can restore in Photos app back from within the app. After Export, Still you can show inside the app, now you can delete it or keep inside. Open Photo in the photos app, Tap on Upper Arrow with Square box. Now, Select “Hide” option. and Hide photo in the hidden folder in the album list. Such great app and easy user interface make this app #1 in Hiding photos on iPhone camera roll or other folders from photos app. Also, share your experience with us related this useful tips or any alternative solution.